Rock candy is easy to make at home, it tastes great, and it's a fun recipe to do with kids. Better yet, it doubles as a science experiment because you get to watch the sugar crystals form. The color and flavoring combinations you can create are endless, so it's also a great opportunity to get creative in the kitchen. This is one of the simplest sugar candies you can make, though it does require patience. It may take up to a week for the rock candy to form, but it’s fun to watch the sugar crystals grow. You should start to see changes within the first few hours. Keep in mind that the exact quantity of sugar syrup you will need depends on the size of jars you're using and how many rock candy strings you want. For example, the recipe's measurements work for about four 12-ounce jars or one quart-sized mason jar. You can easily double or triple the recipe and make more rock candy strings at once. Note: while there are multiple steps to this recipe, this homemade rock candy is broken down into workable categories to help you better plan for preparation. Clean the glass jars thoroughly with hot water. For each jar, cut a length of a thick cotton thread a few inches longer than the height of the jar, and tape it to a pencil. Place the pencil across the lip of the jar, and wind it until the thread is hanging about 1 inch from the bottom of the jar. Attaching a paper clip to the bottom of the thread will weigh it down and help it hang straight. As an alternative, you can use a wooden skewer instead of the string. Use clothespins balanced across the top of the jar to clip it into place. Wet each thread or wooden skewer with water, and roll it in granulated sugar. This base layer gives the sugar crystals something to grab when they start forming. Set these aside to dry while you prepare the sugar syrup. Place the water in a medium-sized pan and bring it to a boil. Begin adding the sugar, one cup at a time, stirring after each addition. You will notice that it takes longer for the sugar to dissolve after each cup you add. Continue to stir and boil the syrup until all of the sugar has been added and it is completely dissolved. Remove the pan from the heat. If you are using colors or flavorings, add them at this point. When using an extract, add 1 teaspoon of extract; for flavoring oils, only add 1/2 teaspoon. Make sure you don’t stand right in front of the pan because the scent can be very strong as it rises in the steam. Add 2 to 3 drops of food coloring and stir it in to ensure an even, smooth color. Allow the sugar syrup to cool for approximately 10 minutes, then pour it into the prepared jars. Lower one sugared string or skewer into each jar until it hangs about 1 inch from the bottom. Carefully place your jar in a cool place, away from harsh lights, where it can sit undisturbed. Cover the top loosely with plastic wrap or a paper towel. You should start to see sugar crystals forming within 2 to 4 hours. If you see no change after 24 hours, try boiling the sugar syrup again and dissolve another cup of sugar into it. Then pour it back into the jar and insert the string or skewer again. Allow the rock candy to grow until it is the size you want. Don’t let it grow too large, otherwise, it might start growing into the sides of your jar! Once it has reached the desired size, remove it and allow it to dry for a few minutes, then enjoy or wrap in plastic wrap to save for later. 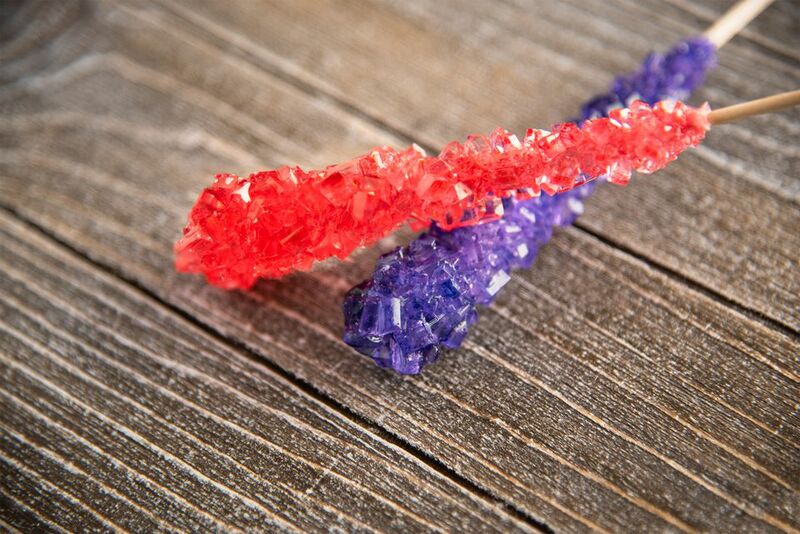 The flavor and coloring combinations of rock candy are endless and you can really get creative with it. You can use an obvious combination such as purple for grape rock candy, or do something totally off the wall and make the flavor a surprise. Browse the options for flavoring and coloring at the store and see what you come up with. Keep in mind that you can use either oils or extracts for flavor. Also, paste or gel food coloring tends to create richer colors than the liquid options, but either will make great looking candy. Raspberry extract with blue food coloring creates a fun and delicious blue raspberry rock candy. Cinnamon oil with red food coloring is fun for the winter and a fantastic treat or gift for the holidays. Peppermint extract with a blue-green food coloring combination is always a delight. Any other mint flavoring is great as well; wintergreen and spearmint extracts are readily available, so choose your favorite. Banana oil with yellow food coloring is always a favorite and kids love it. Maple extract creates an old-fashioned rock candy that doesn't necessarily need any coloring. Other options include star anise for the taste of black licorice (purple), tutti frutti (orange or pink), green apple (green), buttered rum flavoring (orange), cherry (red), grape (purple), or any other fun flavoring you find. Pair these with different colors and you will have a rainbow of flavorful rock candy to share.